Peer teaching is a learning strategy where learners obtain skills or knowledge with the intent to teach other learners. The popularity of this strategy has fluctuated time; last peaking in the mid-seventies. Goldschmit & Goldschmit (1), in 1976 wrote a review on the state of “Peer Teaching in Higher Education” looking at it from socio-psychological, pedagogical, economic and political considerations. Currently, you don’t hear much about it. IMHO, it is because it is difficult to implement effectively. Peer-teaching has a sound basis. Social psychologist, Albert Bandura laid the foundations for the effectiveness of this strategy in his description of “reciprocal determinism” (2). As applied to this strategy, the person preparing to teach another is changed by the process of preparing to teach; he or she learns and retains with significant results. More recently, applications of neuroscience have given us another reason to consider peer teaching as a useful strategy. Prof. Matthew Lieberman author of the book “Social, Why Our Brains Are Wired to Connect” has been making the circuits with the like of webinars and NPR’s Science Friday (3) sharing the results on how our brain functions in response to socially oriented environmental situations. 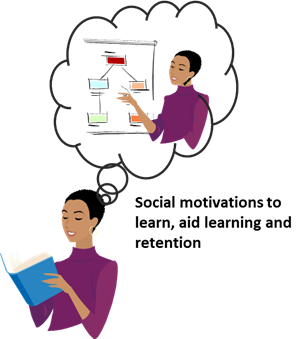 Our social brain has high motivational factors and even a specialized social memory. Dr. Lieberman shares that, when activated, “social motivations to learn” results in more inclusive learning with longer retention, using areas of the social brain. Contrary to a recent comment in a LinkedIn discussion concerning the learning model of Heutogogy, to “Just go teach”, I submit to successfully implement any strategy requires supportive and appropriate tactics. I hope you find the following useful if you choose to include peer teaching in any of your instructional designs. 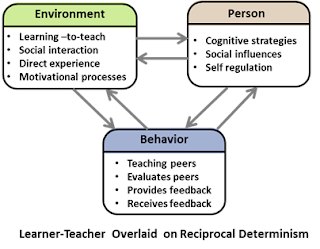 It may be helpful to think of using the peer teaching strategy as the method to implementing Gagne’s “events of instruction”(4): as a method of presenting the stimulus material and providing learning guidance. Cognitive Domain: Heuristic problem solving; problem solving for which no clear procedural rule exists. Examples: designing a peer teaching activity, resolving a political situation, trouble shooting, predicting human behavior. Learning of “continuous skills” (5) which the beginning and ending points are subtle and performer-determined. Examples: dribbling a basketball, swimming, steering a car. Learning of “open skills” (5) in which the environment causes the performance to make continuous adjustments. Examples: playing basketball or hockey where the opponent’s interactions change the dynamic of the situation. · Do the potential learner-teachers have the communication skills to be effective? 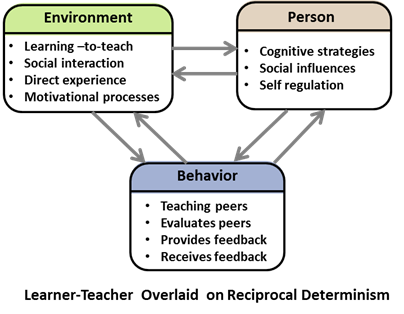 · Are the potential learner-teachers sufficiently motivated to follow through with peer teaching? · What teaching skills will the teacher-learner need? · How will the learner-teacher(s) be prepared to teach: self-study, group instruction and or tutoring? · Do the learner-teachers have the requisite cognitive skills? · This strategy is rather time intensive. Will there be sufficient time and flexibility to adjust for variances in the level of success? · What are the necessary direct and ancillary material for the topic to be taught; for both the learner-teacher and the students? · Would a job aid be appropriate for the learner-teacher to prepare for teaching? · Will you need additional learning space to allow for the learning and preparation? · What will be the learner-teacher to learner ration: one-on-one or one to many? · Will complementary activities for those not preparing to teach be appropriate? Current findings via neuroscience have suggested peer teaching is worth another look; especially where long term retention is desired. I hope you add the peer teaching strategy to your ID’s toolbox. 1. Goldschmid, Babra & Goldschmid, Marcel L. (1976). Peer Teaching in Higher Educations: A Review. Higher Education Vol. 5 Pages 9-33. Elsevier Scientific Publishing Company, Amsterdam, Netherlands. 2. Hergenhahn, B. R., & Olson, M. H. (1993). An Introduction to Theories of Learning, Fourth Edition. Englewood Cliffs, NJ: Prentice Hall. 4. Gagne, R., Briggs, L., Wager, W. (1992). Principles of instructional design (4th Ed.). Orlando, FL: HBJ. 5. Smith, P. L. & Ragan, T. J. (1993) Instructional Design. Upper Saddle River, NJ. Prentice-Hall.